ATM | What Does ATM Mean? 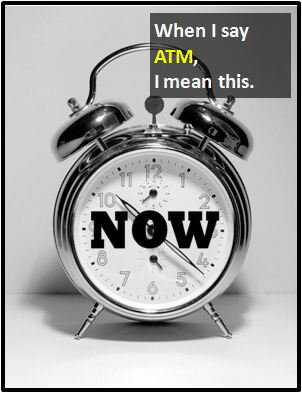 ATM (At The Moment) is used to emphasize that something is occurring "now" (i.e., at the time of sending the message). The image shows a clock to respresent the current moment. We're driving ATM. Text me in 10 minutes. Are you in class ATM? I need to see you. ATM is an initialism abbreviation. This means it is pronounced using its individual letters (i.e., Ay Tee Em). Initialisms contrast with acronyms, which are spoken like words.